Plans to create a bus lane on one of Bristol's busiest roads are being considered by the local authority. Muller Road, which connects Gloucester Road to Eastville and the M32, is often very congested, which causes buses to be late. The council is also considering banning traffic turning right from Glenfrome Road, heading north into Muller Road. Some side streets could also be made one-way to improve traffic flow and reduce traffic on residential streets. 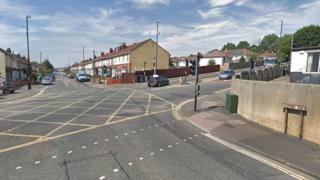 Bristol City Council's plans for a new bus lane for part of Muller Road were unveiled before a new school opens in September on Romney Avenue, the second in the area. Two new supermarkets are also due to open. Councillor Kye Dudd, who is responsible for transport, said the local authority needed to improve safety provisions for school children and offer better walking, cycling, bus and car journeys for everyone. "We also need to take into account new homes, jobs and schools, and the increased journeys these will bring, and these proposals respond to growth in the area," he said. An online consultation runs from 25 February until 7 April on the council website. The council is also proposing a 24-hour bus lane and several turning restrictions along the A4018, which links north Bristol to the city centre.